John’s favourite dish is lasagna and he is always asking me to make it. I prepare it every once in a while, but find it’s tedious to make. I have a lasagna hack that tastes just as good as the real thing, but is a little easier to whip up. 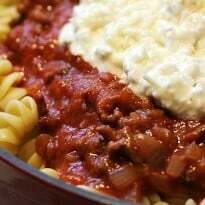 It’s basically cooking your favourite short noodles, making the meat sauce and mixing up some cottage cheese, parmesan and fresh garlic for the cheese topping. It is SO GOOD! John said he approves. For presentation, I put the noodles in the bottom of the bowl, then added the meat sauce leaving a little clearance around the edges and then finally topping with cheese. Mix it altogether before you serve it or let people scoop it from the bowl as is. This is one recipe I keep coming back to time and time again. What is your favourite lasagna recipe? You might also like this Slow Cooker Lasagna. 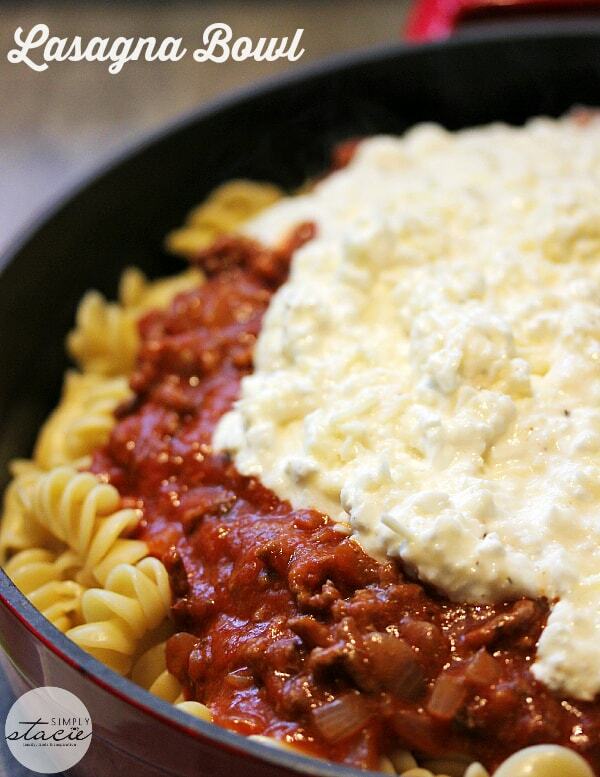 A yummy recipe for Lasagna Bowl that is easier to make and tastes just as good, if not better! Heat olive oil in a pan over medium heat. Add in onions and cook for about 5 to 6 minutes, until softened. Add in ground beef and cook, stirring frequently, until browned. Add in pasta sauce and cook until mixture is heated throughout. Set aside. In a large bowl, mix together cottage cheese, Parmesan, garlic and pepper. Microwave for about 2 minutes to heat up. To assemble, place pasta on the bottom of a shallow bowl or pot. Top with meat sauce mixture. Layer the cottage cheese mixture on top. Serve hot. My mouth is watering already. You always have great looking and tasting recipes and this one is no exception. This recipe is much easier to make and less time-consuming. Thanks for sharing. Thanks for sharing this! looks so yummy!! This looks so good gonna have to try it sometime. So nice to have discovered your blog on the Weekend Re-Treat Party… such a fun recipe! 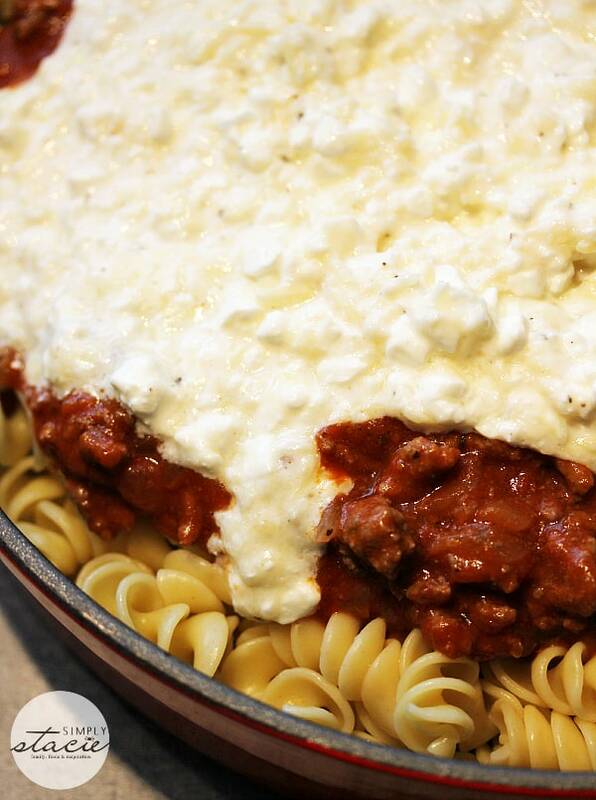 Wow this looks delicious, I recently made a lasagna in the crock pot and it turned out awesome. My husband asks for lasagna often…and boy do I dislike making it! So much work and mess. This is a fabulous idea! This looks delicious, I’ll be trying it soon as my son loves lasagna and this looks much simpler to make. Thanks for sharing! This looks simple and very yummy! I will have to try it soon! I love this because its a great shortcut while still enjoying the lasagna flavor. Mmmm looks simple yet super delicious. Thanks for sharing the recipe. What a great idea! I, too, find the layers to be too tedious at times… I will be trying this idea with my own favorite recipe (from the Barilla flat lasagna noodles box) sometime soon! Oohh this looks so rich and yummy..have to try this!! Hhmmm this looks so yummy..cant wait to try it! This looks so good. I might have to make this this week. I think that would work too – try it and let me know how it tastes! What jar of sauce did you use?